After Slack is connected how do I send leads to Slack? There are four things you can do with your Slack integration. 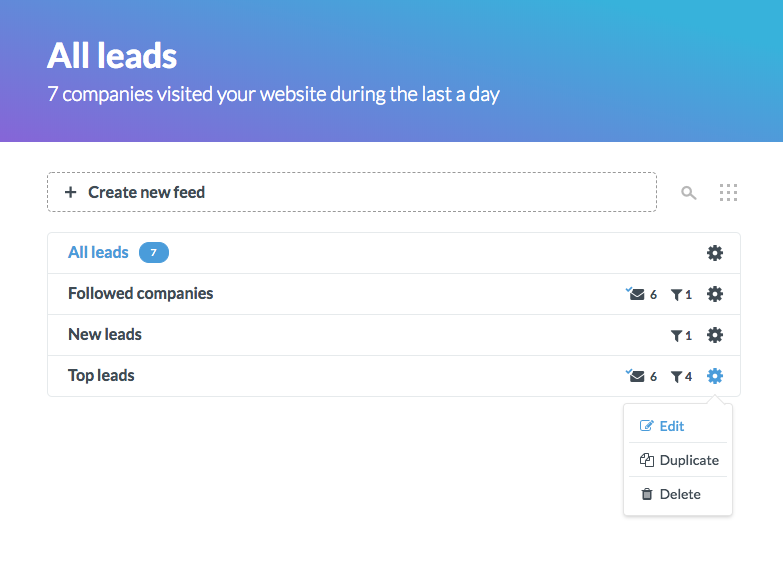 Get notified about your custom feeds' leads in Slack. This can be either one message per time or all leads split to separate messages. 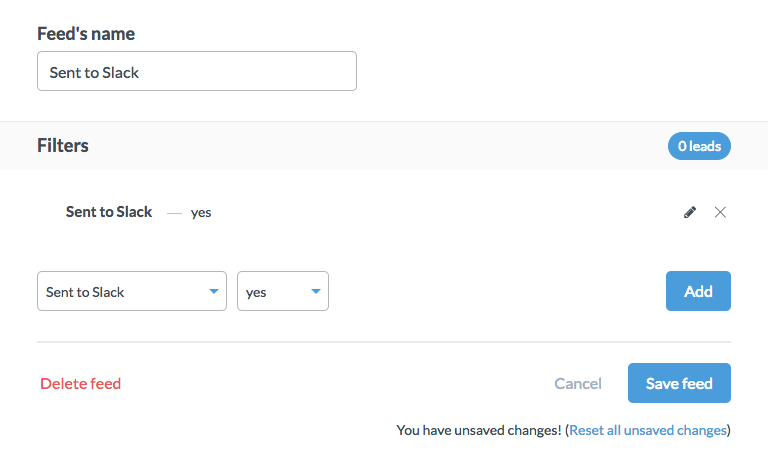 Filter leads by the criteria "Send to Slack manually"
When you spot an interesting lead and want to send it over to Slack, click the Send to Slack button next to the lead. The lead will be visible in the selected channel! NOTE: Read this article in order to send leads to private Slack channel. 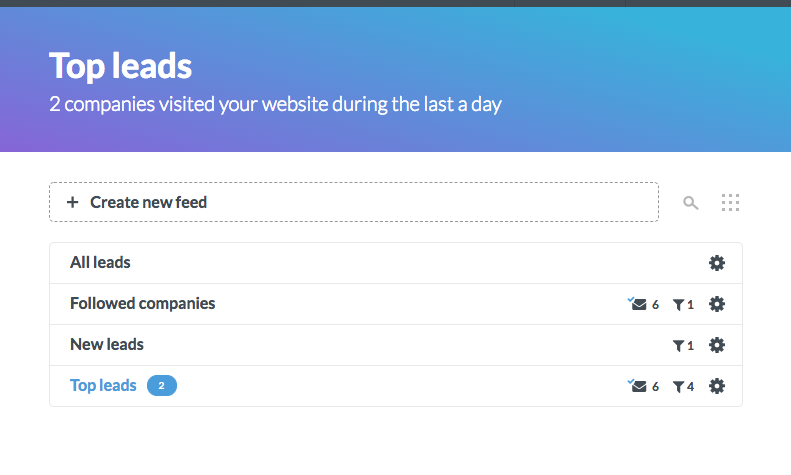 To configure your custom feeds' notifications be delivered to Slack, click on Edit on one of the feeds. NOTE: You can enter the view with custom feeds by closing the lead you have currently open. Enter the tab for Slack notifications, choose which channel you want to get the notifications to, and click Add. By default you'll see public channels, but also a private channel can be added by following the steps of this article. 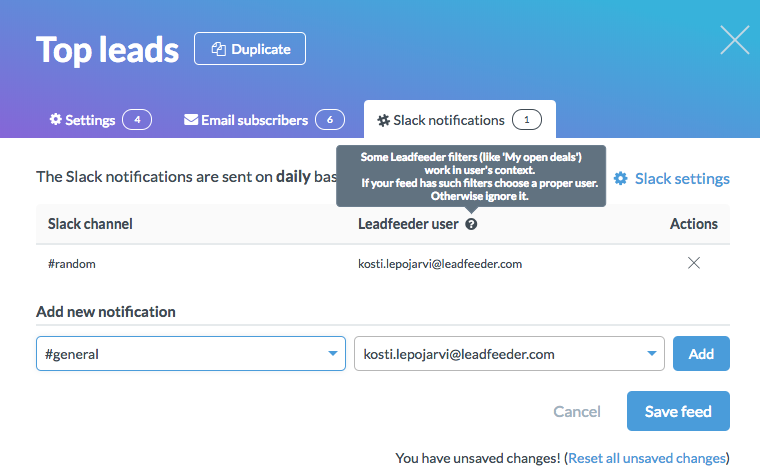 NOTE: The Leadfeeder user selection is only concerned if you use filters such as My open deals, which require user specific criteria. In most cases just selecting yourself as a user is fine. If you want to split the daily compilation to separate messages instead of having a chunk of leads in one message, enable in your Slack settings (check screenshot below). This is helpful when you want to start a discussion thread for a single lead in Slack. 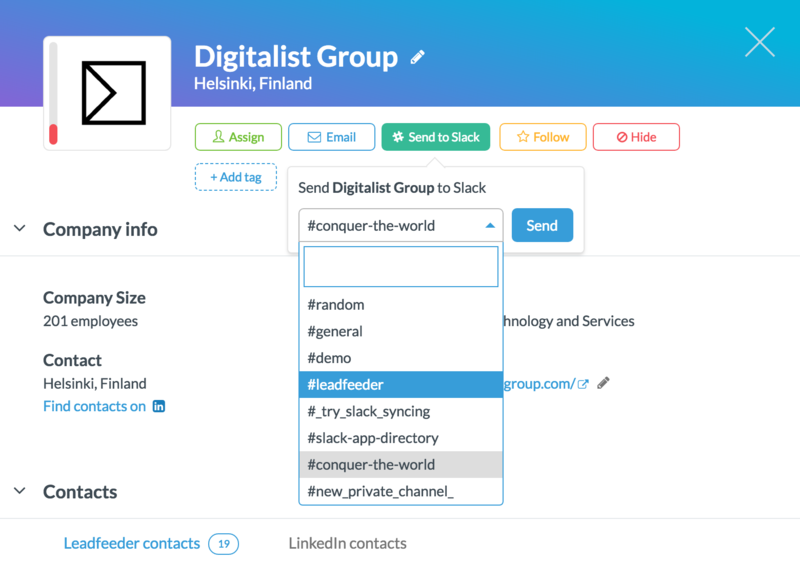 If you want to check which leads have been sent to Slack manually (see part 1 in this article), click on + Create new feed. Choose the Sent to Slack from the filters drop-down and click on Add. Finally name the properly and save the feed. This helps you to keep on track in real-time when leads are assigned to different team members. Check more details on this article.